When you recycle your cans at AAA Recycling Centre you are doing much more than getting a cash refund and keeping South Australia looking beautiful. AAA Recycling Centre provides 10 cent refunds on all aluminium cans that are covered by the South Australian government’s CDL (Container Deposit Legislation). 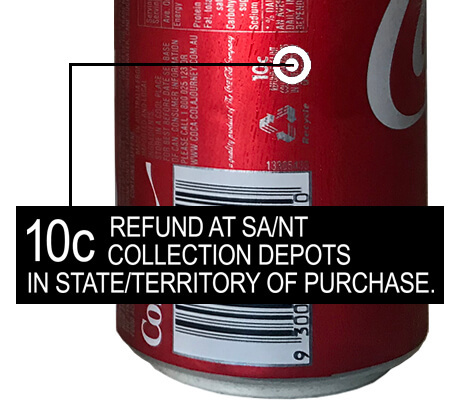 PLEASE NOTE: It is illegal to return beverage containers sold outside of South Australia for a refund. We really appreciate it if the cans are not crushed when they are brought in for recycling, it makes reading the labels difficult for refunds and crushed cans often have sharp edges which can cause injury to our staff. If you’re in the Burton / Salisbury area of Adelaide’s Northern Suburbs and would like to recycle your cans for cash please call: (08) 8280 6350. AAA Recycling Centre is one of Adelaide’s leading can recycling facilities. Every week we receive thousands of cans that qualify for the South Australian government’s container deposit refund scheme. can be returned to AAA Recycling Centre to collect a 10 cent refund for each aluminium can. The ingots are sent to a rolling mill where they are rolled into sheets – this gives the aluminium strength and greater flexibility. Manufacturers use the rolled aluminium sheets to produce new aluminium cans. In little over a month, the cans delivered to AAA Recycling Centre are sent back to the shops ready to be used again. Over 90% of the drink cans made and sold in the Australia are aluminium, but there’s more to aluminium packaging than just cans! Aerosols, foil food trays, wrappers and bottle tops are also made of aluminium – there is an awful lot more that can be recycled. The drinks can that you recycle with AAA Recycling Centre today could be made into a new can, filled and put back on the shelf in just 60 days. In one year, that can could be recycled six times, saving enough energy to make 160 new cans. Recycling aluminium saves around 95% of the energy needed to make the metal from raw materials. In addition to the energy savings, recycling aluminium saves around 95% of the greenhouse gas emissions compared to the ‘primary’ production process. Recycling 1 tonne of aluminium saves 9 tonnes of CO2 emissions; When you consider that 1 tonne of CO2 is equivalent to driving a car 2800 miles, the benefits of recycling really start to become clear.